I had a long conversation with a liberal friend of mine the other day, a friend I haven’t spoken to for some time. Although he’s “progressive,” he does listen to what I have to say, doesn’t dismiss my opinions outright, and hence still can be called a friend. As always seems to happen with liberals these days, the “Trump thing” came up, and I braced myself for the inevitable narrative that the left incessantly promotes. “Why do you say that?,” I responded. There we have it. I’ve had the issue of President Trump, Vladimir Putin and Russia thrown in my face repeatedly in recent days, when giving speeches and the like. Here is how I always respond. First, I make it very clear that with the previous administration, all the right things were said. President Obama was nothing if not a very good orator, able to make the crowd “feel” a certain way about his policies and agenda. It was smooth — No-Drama Obama. With Mr. Obama, the only adult in the room, in charge, all was good with the world, the seas were calmed, and our enemies — flattered and charmed by Mr. Obama’s bows — agreed to work with us. While I don’t think Mr. Obama was good for our national security, he sure talked the talk. But those promoting the “Putin must have something on Trump” narrative ought to look at the actual national security consequences of the Obama presidency. First, under Mr. Obama’s watch, an Islamic “caliphate” was set up in the Middle East. The Muslim Brotherhood, a terrorist-enabling organization, gained power in Egypt and elsewhere. Iran signed a deal that still gives the mullahs a pathway to nuclear weapons, along with planeloads of cash and barrels of petrodollars to underwrite terror networks and splurge on Russia weaponry. In Asia, North Korea developed a nuclear-weapons capability and threatened American cities with destruction. China made aggressive claims on the South China Sea. The Philippines and other Asia-Pacific allies were driven into Beijing’s arms, and Israel was left to face a rising Iran and its proxy armies from Baghdad to Beirut. However, the most striking development during the Obama years was Russia’s annexation of nearby territory by force. This came after the U.S. military was allowed to weaken. 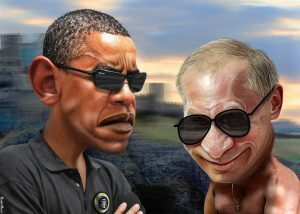 Mr. Obama’s infamous 2012 comment to Russian Prime Minister Dmitry Medvedev, “Tell Vladimir I can be more flexible after the election,” was a green light for the Kremlin. It was all Mr. Putin and his generals needed to hear. Soon Crimea was annexed, eastern Ukraine was under artillery attack, civilian airliners were being shot out of the sky. Mr. Putin also deployed an expeditionary force to Syria to support his ally, Bashar Assad, and re-establish Russian influence in the region. What did the Obama administration do? Nothing. A few diplomats were expelled after the American 2016 presidential election, when Russia’s attempts to hack the election were exposed. By contrast, Mr. Trump in a very short period of time has effectively destroyed Islamic State, launched 60 cruise missiles at Syrian fighter planes to punish a chemical weapons attack, sanctioned Mr. Putin and his oligarchs multiple times, and, in the coup de grace, killed possibly hundreds of Russian mercenaries as they tried to advance on American forces in Syria. Not “threatened,” not “negotiated with” — killed. It’s time the liberal media and the Deep State admit Mr. Trump has been much tougher on Russia than Dear Leader Obama ever was. For Mr. Obama, it was all a show designed to make him look good on TV and with the U.N. crowd. For Mr. Trump, the policy toward Russia — and any other country — is about the American people and protecting their security. If Mr. Trump thinks we should start pulling our troops out of Syria because it’s in our interests to do so, then I trust him. We don’t need their oil anymore anyway. He’s earned the right to make that decision. Mr. Obama earned nothing but ridicule for his policies and their consequences.